WILMINGTON, N.C. — Blowing ashore with howling 90 mph winds, Hurricane Florence splintered buildings, trapped hundreds of people and swamped entire communities along the Carolina coast Friday in what could be just the opening act in a watery, two-part, slow-motion disaster. At least four people were killed. As 400-mile-wide Florence pounded away at the coast with torrential downpours and surging seas, rescue crews used boats to reach more than 360 people besieged by rising waters in New Bern, while many of their neighbors awaited help. More than 60 people had to be rescued in another town as a cinderblock motel collapsed at the height of the storm’s fury. Florence flattened trees, crumbled roads and knocked out power to more than three-quarters of a million homes and businesses, and the assault wasn’t anywhere close to being over, with the siege in the Carolinas expected to last all weekend. ‘‘It’s an uninvited brute who doesn’t want to leave,’’ said North Carolina Gov. Roy Cooper. Personnel from New England have already been deployed to help out with Hurricane Florence response and recovery efforts. The hurricane was ‘‘wreaking havoc’’ and could wipe out entire communities as it makes its ‘‘violent grind across our state for days,’’ the governor said. He said parts of North Carolina had seen storm surges — the bulge of seawater pushed ashore by the hurricane — as high as 10 feet. ‘‘I feel like the dumbest human being who ever walked the face of the earth,’’ he said. Florence’s forward movement during the day slowed to a near-standstill — sometimes it was going no faster than a human can walk — and that enabled it to pile on the rain. 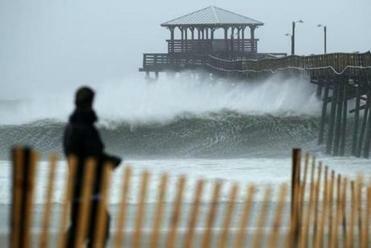 The town of Oriental, North Carolina, got more than 20 inches just a few hours into the deluge. Other communities got well over a foot. Meteorologist Ryan Maue of weathermodels.com said Florence could dump a staggering 18 trillion gallons of rain over a week on North Carolina, South Carolinas, Virginia, Georgia, Tennessee, Kentucky and Maryland. That’s enough to fill the Chesapeake Bay or cover the entire state of Texas with nearly 4 inches (10 centimeters) of water, he calculated. ‘‘The wind was so hard, the waters were so hard, that trying to get out we got thrown into trailers. We got thrown into mailboxes, houses, trees,’’ said Holt, who had stayed at home because of a doctor’s appointment that was later canceled. She retreated and was eventually rescued by a boat crew; 140 more awaited assistance.